Confiscation of the pearls of Russian and Ukrainian Christianity by imposters has begun. Two excellent Russian TV reports here exposing the astonishing attack on Ukrainian Orthodox Christians who belong to the Russian church, by far the largest Christian group in the Ukraine. Russian media is giving heavy coverage to what can only be described as an outrage. "The Dormition Cathedral, the Trinity Cathedral, bell towers, holy gates, brethren's houses, and the bishop's house at the Pochayev Lavra are being taken away from the monks. . . . the next step of the Ukrainian government is to seize the church." The Dormition Cathedral, the Trinity Cathedral, bell towers, holy gates, brethren's houses, and the bishop's house at the Pochayiv Lavra are being taken away from the monks. The agreement on the uncompensated use of architectural monuments of 2003 has been declared invalid. There's no doubt that the next step of the Ukrainian government is to seize the church. A wave of deterrence against the Ukrainian Orthodox Church swept over the country. – Vladyko Irenaeus, do not betray Ukraine! – We didn't betray anyone. We're going to form a council. You should come with us. This picket was held by the seat of the Eparchy of Dnepropetrovsk. Schismatics tried to get Metropolitan Irenaeus to join them. In Lutsk, seasoned punishers handed Metropolitan Nafanail of Volyn a written ultimatum, demanding that he do the same. At the bottom of the document, is the seals of 15 nationalist groups. Death threats were made against Metropolitan Luka in Zaporizhia. The schismatics demand that he join them as well. The bishop didn't hear any of that: he was called in by the Security Service of Ukraine. More than ten Archpriest have been questioned by the SBU over the last few days. Poroshenko is grasping at every lawful bishop who is still willing to listen to his promises. Here's some footage of him praising the metropolitan of Cherkasy and Kaniv. Government officials, members of parliament, spiritual leaders, and Metropolitan Sophronius got on their feet. The thunderous applause grew into an ovation. Poroshenko continued to compliment him profusely. Poroshenko announced that Metropolitan Sophronius would attend a gathering of schismatics and switch to Constantinople's church. However, the metropolitan himself sees the situation differently. Metropolitan Aleksandr also doesn't shy away from visiting Poroshenko. The Ukrainian government has labeled him as a schismatic. However, the metropolitan doesn't recommend jumping to conclusions. 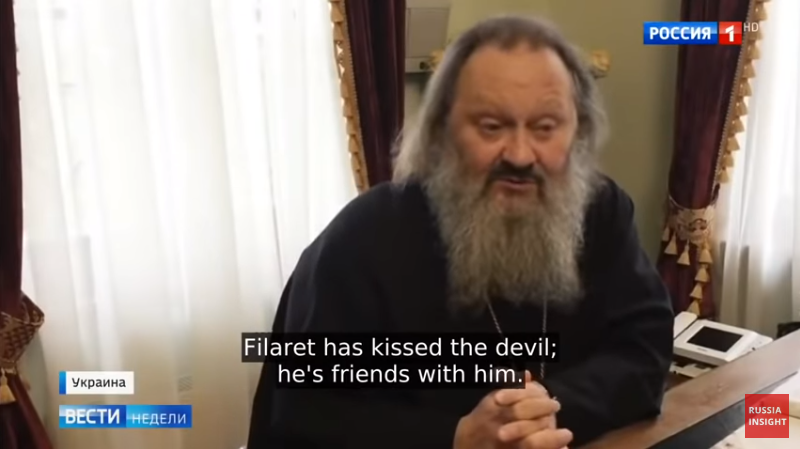 Poroshenko's problem is that the only person who actually wants to head the new schismatic union, is Mikhail Denisenko, or Filaret, the fake Patriarch of Kiev. He claims to have quit the contest for the new cathedra. But how can you believe someone who lost his status as a bishop and a monk and was excommunicated by the church for breaking his vows? Poroshenko used to have a candidate for the leader of schismatics: Simeon, Metropolitan of Vinnytsia, an old friend of the Ukrainian president. But out of nowhere, the metropolitan convened priests and declared his loyalty to the lawful church and its canons. Poroshenko's election campaign is about to collapse. The Ukrainian president has requested autocephaly from Istanbul, which was supposed to give the schismatics independence. However, the only thing that's changed is the schismatics have a new leader. First, it was the fake patriarch of Kiev, now it's the patriarch of Constantinople. By the way, there's a star and crescent flag flying over his residence. Despite the title of ecumenical patriarch, Bartholomew's jurisdiction is limited to a neighborhood in downtown Istanbul and a small community in America and Canada. Poroshenko has already taken the Saint Andrew's Cathedral from the schismatics and given it to the patriarch of Istanbul. It's one of the symbols of Kiev and was designed by Rastrelli. He also promised to give him over twenty other churches located all over the country. Poroshenko is running out of time. The election will be held in March. Since the Ukrainian president has no other leverage, he's engaging the entire governmental apparatus. Poroshenko's career is at stake. On the other side is the faith of millions of Ukrainian people. Today, President Pyotr Poroshenko proposed to the Verkhovna Rada that they terminate the Treaty on Friendship, Cooperation, and Partnership with Russia. In the meantime, the Security Service of Ukraine has begun interrogating priests of the Ukrainian Orthodox Church of the Moscow Patriarchate. They seek to create a new religious structure wholly subordinate to the Maidan authorities. Kiev is now openly terrorizing the canonical church in order to force it to unite with the schismatics. Alexander Balitsky's report on how Ukraine is interpreting freedom of religion today. This is not merely threats now. Kiev. Ovruch. Korosten. These are recent photos from Zhytomyr. The house of Father Sergiy, the head of the Cross Cathedral, was searched for leaflets which allegedly incited interfaith hostility. Nothing was found but, but Father Sergiy's computer, phones, and flash drives were seized anyway. The Ministry of Justice decided to take away the Pochaev Lavra from believers of the canonical Orthodox Ukrainian Church. They are holding round-the-clock duties and prayers there. Vladimir, Metropolitan of Pochaev: "We not going to leave. This is our home, our shrine. We were born on this land, we went to Ukrainian schools." At least 20 priests of the Roven and Sarny eparchies got such summons from the SBU to immediately appear for interrogation. These eparchies are a part of the Ukrainian Orthodox Church, which submits to the Moscow Patriarchate. Together with the believers, the opposition also addressed the authorities. “This is cynicism because according to the Constitution, the church is separate from the state. He's making a religious conflict within the state, dividing the people on religious issues, which will lead to a huge problem for all believers." In the Rada, they tried to draw attention to the issue of the church repartition. Vadim Novinsky, Opposition Block Chairman: "There's blackmail, threats, which is done to accomplish one simple goal — to force the bishops of the canonical church to take part in the united council of the so-called church, which people already call the Church of Poroshenko's Patriarchate." This Patriarchate hasn't been established yet, but the Rada Speaker has proposed to hand over the famous St. Sophia Cathedral to it, a monument of architecture from the times of Kievan Rus, a UNESCO World Heritage Site. There's an attack on anything that has even the slightest connection with Russia. Poroshenko introduces to the Parliament a bill on the termination of the Treaty on Friendship with Russia with a note saying "urgent". The same urgent manner in which Poroshenko sent warships to the Kerch Strait. Today, he admitted it. Pyotr Poroshenko, President of Ukraine: "When they say we should've used different overland ways to drag Ukrainian ships to Sukhodol, what does this mean, dear politicians? To give the Kerch Strait to Russia?" Here is a new decision: Ukraine is pushing armored vehicles to the borders with Russia and is gathering up reservists. Recruits swear the oath on the square in Chernigov. Here's Chernigov as well. These are people at a bus stop. But national television channels are immersing the country into a state of pre-war hysteria. Martial law has affected the already weak economy. International companies are breaking investment contracts. Credit lines are in danger as well. But this is the last chance for Poroshenko to remain in office. The presidential campaign will officially start on December 31st. Martial law, which prohibits elections, was introduced for 30 days but it's easy to prolong it. Poroshenko published a video with servicemen on Facebook and he added a comment — "We shall keep the gunpowder dry." And yes, "Gunpowder" is exactly the nickname of the president among Ukrainians. The comment became a matter for jokes in no time — what is wet about Poroshenko and whether he can dry it.